Omnii XT15 - Adaptive by design! The Omnii™ XT15 combines extreme versatility with open innovation. It takes the best features of the Omnii™ XT10 and adds new functionality to create a device that gives mobile workers greatest access to business applications – anytime, anywhere. 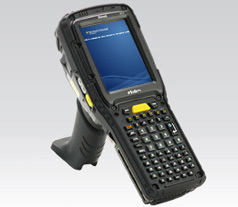 With its certified IP67 and IP65 rating, the Omnii™ XT15 is the most rugged handheld device Psion has ever made. Delivering reliable performance and unparalleled adaptability for the most demanding of environments and applications. Seamless integration to automate key processes and boost productivity in real-time. Future-proof flexibility allowing hardware to be reconfigured and not replaced. Improved worker visibility and 95db keypad beeper with vibration feedback that’s perfect for loud industrial environments. Balanced construction that is perfectly weighted for comfort, practicality and Natural Task Support.